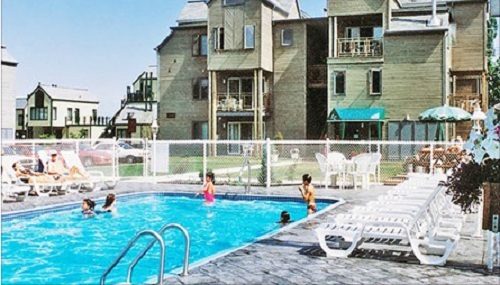 Club Vacances Toutes Saisons is located near Mont Ste-Anne, Quebec's premier ski area. Enjoy 7 Nights at Club Vacances Toutes Saisons in Beaupre Quebec located near Mont Ste-Anne Ski Resort! Club Vacances Toutes Saisons is a four-season resort with Quebec-style hospitality and creature comforts. This resort urges guests to enjoy the sights of Canada; however, there are excellent amenities and activities right on the property as well. Pamper yourself at the fine restaurant, Internet café, bar, massage therapist, tennis courts, and two heated pools. Enjoy tennis, badminton courts, volleyball, and a playground for children. Additional amenities and services include laundry, concierge, DVD rental, picnic areas, free parking, and daycare. Club Vacances Toutes Saisons offers condos that beckon weary skiers and sightseers with a warm fireplace, balcony, and TV with Cable and DVD. Each unit has a partially or fully equipped kitchen with microwave and dishwasher, full bathroom, ski storage space, telephone, and washer/dryer. Make Club Vacances Toutes Saisons your home away from home in lovely Quebec. The resort has 3 floors, no elevators and no air conditioning. Your 1 Bedroom Suite will accommodate up to 4. The unit has a full kitchen, 1 queen bed and a sleep sofa. FOR ONLY $100 FOR THE WEEK! Your 2 Bedroom Suite will accommodate up to 6 people. The unit has a full kitchen, 1 queen bed, 2 twin beds, and a sleep sofa. A Security Deposit of $200 is required. Most Activities Are In The Area, Not On-site. Outdoor Pool, Indoor Pool, Jacuzzi, Sauna And Gym Are At A Hotel Which Is One Kilometer From The Resort. The Cost For The Use Of The Amenities Is A One Time Fee Of $10 Per Person. Check-in is at 4PM. If arrival late please contact the resort in advance.